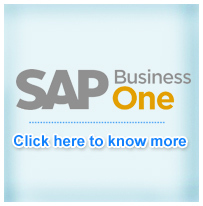 Drawing upon our 35 years of experience in developing business management software, SAP built SAP Business One from the ground up – exclusively to meet the changing and industry-specific needs of small businesses like yours. Financial management – Automate, integrate and manage all your financial and accounting processes. Warehouse and production management – Manage inventory across multiple warehouses, track stock movements and manage production orders based on material requirements planning. Customer relationship management – Grow customer profitability and increase customer satisfaction with effective sales and opportunity management and after-sales support. Purchasing – Automate your entire procurement process from purchase order to vendor invoice payment. Reporting – Act on instant and complete information with comprehensive, real-time reports.